Ruth Salzmann, Germany, c. 1938. In honor of the 20th anniversary of the Iowa Women’s Archives, we have mounted an exhibit in the North Exhibition Hall of the University of Iowa’s Main Library. The inspiration for this exhibit came from the many visits made to the archives by families and friends of donors. Earlier this year, Sam Becker brought his grandchildren to the archives to look at the papers of their grandmother, Ruth Salzmann Becker. As they learned of her narrow escape from Nazi Germany in 1938, Ruth Salzmann’s story became one of the migration paths featured in the exhibit. “Pathways to Iowa: Migration Stories from the Iowa Women’s Archives” seeks to acknowledge the donors of the precious letters, photos, diaries, and memoirs that make up the collections preserved in the Iowa Women’s Archives. At the same time, it seeks to re-frame our understanding of Iowa history. Beginning with the migration path of Iowa’s first people, the Meskwaki, it integrates the familiar story of European settlement with a lesser known history of African American and Mexican migration in the late-nineteenth and early-twentieth centuries. LULAC women share their stories, Davenport, 2007. For the past seven years, through its Mujeres Latinas Project, the archives has worked to preserve the early history of Mexican migration to Iowa. We chose to highlight these materials in this exhibit because it is a history that has been hidden for too long. The Iowa Women’s Archives wishes to thank all of those who shared their stories with the Iowa Women’s Archives. A special thanks goes to the members of the Davenport League of United Latin American Citizens – LULAC Council 10 – who have done so much to preserve and bring to light the rich history of Iowa Latinas, their families, and organizations, and donated their records to the Iowa Women’s Archives so that others could learn this important history. Please join the Iowa Women’s Archives for a uniquely Iowan perspective celebrating the centennial of the 1912 Lawrence, Massachusetts, textile strike. The March 6 event, run as part of Women’s History Month, will premiere the play, “Bread, Roses and Buttons: Pearl McGill and the 1912 Lawrence Textile Strike,” written by Janet Schlapkohl, an MFA candidate in the University of Iowa Theater Arts Department. One hundred years ago this month, seventeen-year-old Iowa labor activist Pearl McGill played a leading role in the work stoppage of 25,000 New England textile workers, famously known as the “Bread and Roses” strike. 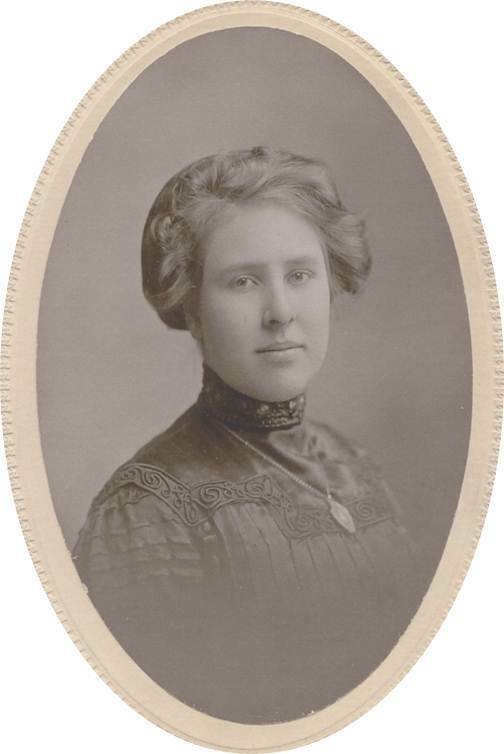 But the seeds of her activism were sown in Iowa’s pearl button industry in Muscatine where McGill advocated for the labor rights of 2,500 men, women, and children who faced poor wages and working conditions in the city’s numerous button factories. This event will be held from noon to 1:00 p.m. on Tuesday, March 6 in the 2nd-floor conference room (2032) of the UI Main Library (Madison and Burlington street). Individuals with disabilities are encouraged to attend all University of Iowa-sponsored events. If you are a person with a disability who requires an accommodation in order to participate in this program, please contact the Iowa Women’s Archives by calling (319) 335-5068. We have just processed a large addition to the Iowa Federation of Women’s Club (IFWC) records. The IFWC was founded in 1893 to help women’s clubs from across the state to communicate and collaborate. The Iowa chapter was the first state federation to join the national one—the General Federation of Women’s Clubs (GWFC). By the 1980s, the GFWC was considered the largest and oldest non-denominational women’s organization in the world. Women in the organization campaigned for literacy, conservation and civic responsibility, but there was also a serious peace movement in the IFWC following World War I. A county and city federation scrapbook compiled by Blanche Wingate in 1923-1924 (Box 20) reveals how club women actively campaigned for peace in the interwar years. Other clippings in this particular scrapbook highlight a Daughters of the America Revolution event, a fashion show and meetings of the executive officers of the club. Student processor Annette Bramstedt just helped finalize a new exhibit in honor of the 90th anniversary of women’s suffrage in the United States (and Iowa). Bramstedt says working on the exhibit broadened her view of women’ s suffrage—she didn’t realize how much the women of Iowa played a role in national events. Some highlights of the exhibit include quotes from influential women, photos and a 1920-1945 ledger from the League of Women Voters. Several IWA collections have material relating to women’s suffrage. 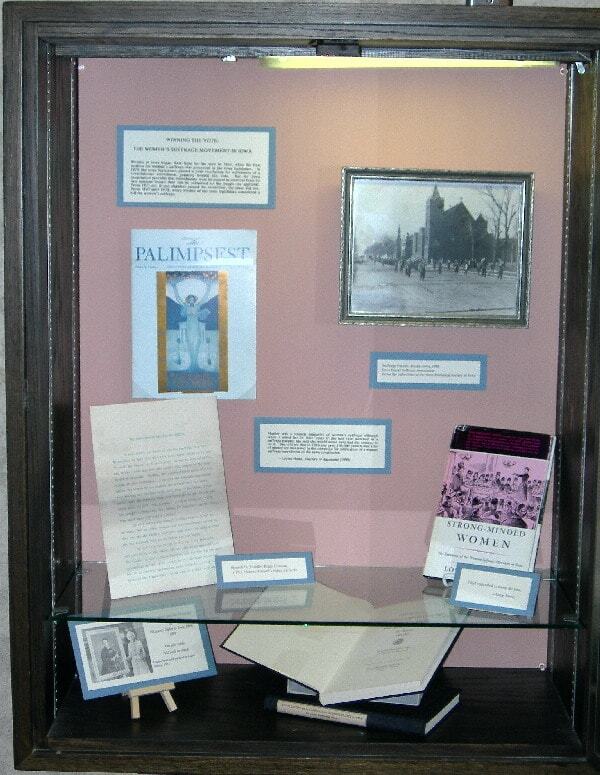 To see the exhibit for yourself, visit the 3rd floor of the Main Library—right outside the Iowa Women’s Archives.